Go to original pattern for design DROPS 188-35. Knitted jacket worked in a circle with garter stitch. 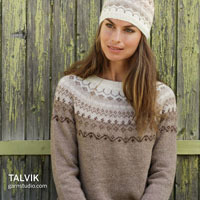 Size: S - XXXL Piece is knitted in DROPS Brushed Alpaca Silk. DROPS DOUBLE POINTED NEEDLES AND CIRCULAR NEEDLE (40 and 80 cm / 16'' and 32'') SIZE 5.5 mm/US 9 – or size needed to get 16 stitches and 22 rows in stockinette stitch = width 10 cm / 4'' and 10 cm / 4'' vertically. DROPS Needles size 4.5 mm / US 7 for rib – or size needed to get 18 stitches and 23 rows in stockinette stitch = width 10 cm / 4'' and 10 cm / 4'' vertically. 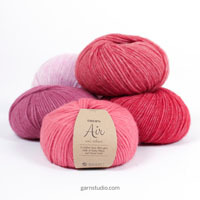 You can get the yarn to make this pattern from	67.15$. Read more. All increases are done on 1 round with knit. 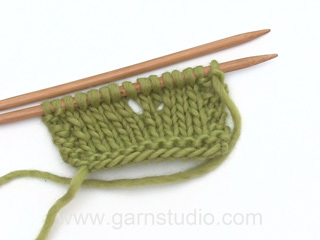 Work until the knit stitch, make 1 yarn over, knit 1 (= the knit stitch), make 1 yarn over (= 2 stitches increased). Repeat at every knit stitch (= 32 stitches increased on round). Purl the increased stitches twisted on next round to avoid holes. Then work them in garter stitch until finished measurements. Piece is worked from the middle and outwards, first work back and forth and then in the round. 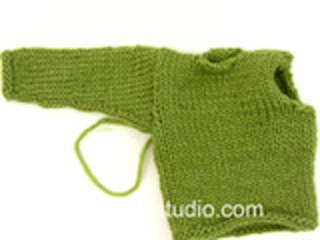 Divide the piece, bind off stitches and work back and forth on each front piece. Work sleeves back and forth separately and sew them on when finished. First work back and forth on 2 double pointed needles, then work in the round on 5 double pointed needles. Switch to circular needle when there are enough stitches. Cast on 8 stitches with Brushed Alpaca Silk on double pointed needles SIZE 5.5 mm/US 9 / US 9. Work according to A.1 (= 8 repetitions of 1 stitch) back and forth. When A.1 has been worked 1 time vertically, there are 32 stitches on row. Piece measures approx. 6 cm / 2 3/8'' in diameter. REMEMBER THE GAUGE! Then work pattern according to diagram A.2 (= 16 repetitions of 2 stitches). Round begins mid back of neck. Continue this pattern, i.e. increase 2 stitches in every repetition every 10th round. Work until piece measures 36-38-40-42 cm / 14 1/4"-15"-15 3/42-16½'' in diameter = approx. 192-224-224-256 stitches (= 32 knit stitches with approx. 5-6-6-7 stitches in garter stitch between each). Make armholes as follows (adjust so that the next 2 rounds are not increase rounds): Work the first 31-33-35-37 stitches as before, bind off the next 28-32-36-38 stitches (make sure to avoid a tight bind-off edge, use a larger needle if needed), work as before until 59-65-71-75 stitches remain (= approx. 74-94-82-106 stitches), bind off the next 28-32-36-38 stitches, work the last 31-33-35-37 stitches as before. On next round cast on 28-32-36-38 new stitches over the bind off stitches in each side (make sure to avoid a tight cast-on edge) = approx. 192-224-224-256 stitches. 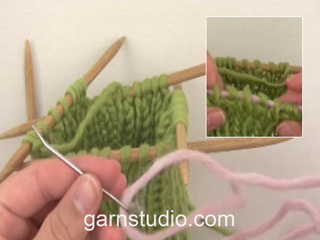 Now work pattern over A.2 as follows: * work in GARTER STITCH – see explanation above, until 2nd knit stitch in first /next repetition of A.2 (= approx. 6-7-7-8 stitches in garter stitch, i.e. work in garter stitch over first knit stitch), knit 1 as before (= the knit stitch), garter stitch over the last stitches in A.2 (= 5-6-6-7 stitches, i.e. there is only 1 knit stitch in every repetition) *, work from *-* the entire round (= 16 knit stitches in total on round with approx. 11-13-13-15 stitches in garter stitch between each). 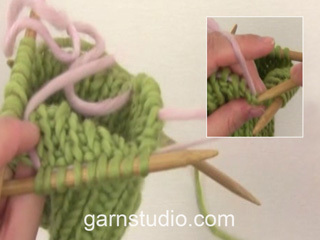 Continue pattern until finished measurements AT THE SAME TIME increase 1 stitch on each side of every knit stitch every 10th round as before – read INCREASE TIP. Continue like this until piece measures 96-102-108-112 cm / 37 3/4"-40"-42½"-44'' in diameter, adjust so that last round is purled over stitches in garter stitch = approx. 480-544-576-608 stitches. Now divide the piece for front pieces as follows: Cast of the first 40-45-48-51 stitches, knit over the next 120-135-144-153 stitches (= left front piece), bind off stitches until 160-180-192-204 stitches remain (= approx. 160-184-192-200 stitches bind off), knit over the next 120-135-144-153 stitches (= right front piece), then slip them on a stitch holder, bind off the last 40-45-48-51 stitches. Cut and fasten the thread. Continue pattern back and forth over the 120-135-144-153 stitches (1st row = from wrong side) AT THE SAME TIME bind off the first 2-3-3-3 stitches at beginning over every row (i.e. Bind off 2-3-3-3 stitches in each side). Continue pattern and bind off like this until piece measures 63-63-66-68 cm / 24 3/4"-24 3/4"-26"-26 3/4'' in total from middle of circle (i.e. front piece measures approx. 15-12-12-12 cm / 6"-4 3/4"-4 3/4"-4 3/4'') = approx. 20-15-24-33 stitches remain. Bind off the remaining stitches. Work as left front piece. Work sleeve back and forth on needle/circular needle. Cast on 38-42-42-46 stitches (including 1 edge stitch in each side) on needle size 4.5 mm / US 7 with Brushed Alpaca Silk. Work rib (= knit 1/purl 3) with 1 edge stitch in GARTER STITCH - see explanation above, in each side of piece. When piece measures 5 cm / 2'', switch to circular needle SIZE 5.5 mm/US 9 / US 9 and work in stockinette stitch with 1 edge stitch in garter stitch in each side of piece. When piece measures 10 cm / 4'', adjust so that next row is from right side, increase 1 stitch, by making a yarn over inside 2 stitches in each side of piece = 2 stitches increased. Purl yarn over twisted on next row (= from wrong side), it should not make holes. Increase like this every 3-2½-2-1½ cm / 1 1/8"-7/8"-3/4"-½'' 11-12-15-17 times in total = 60-66-72-80 stitches. When piece measures 42-42-40-40 cm / 16½"-16½"-15 3/4"-15 3/4'', bind off stitches for sleeve cap at beginning of every row (i.e. in each side of piece) as follows: bind off 3 stitches 1 time, then 1 stitch 14-18-20-26 times in total, then bind off 1 stitch at beginning of every other row (i.e. in each side of piece) 7-6-7-5 times in total = 12 stitches. Piece measures approx. 55-56-56-57 cm / 21½"-22"-22"-22½''. Bind off the remaining stitches. Make another sleeve the same way. Sew in sleeves and sew underarm seam inside 1 edge stitch. 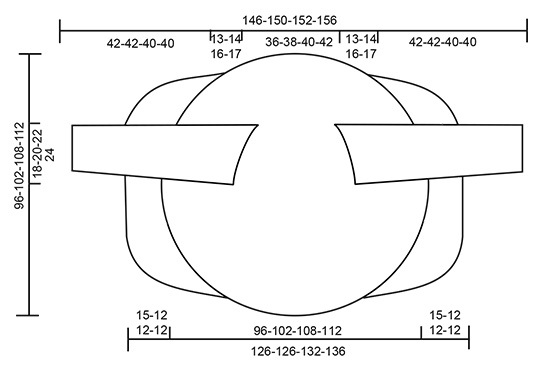 Sew the inner circle together in outermost loop of edge stitch (= approx. 3 cm / 1'' seam). Dan brei ik dus: 2 pennen om 3 steken af te kanten, 14 pennen waarbij ik aan het begin en einde 1 steek afkant (????) en weer 14 pennen om 1 steek af te kanten. Dat is samen 30 pennen en zou een totaalhoogte van plm. 13 cm zijn. Kant ik alleen aan het begin van de pen af, dan kom ik op 44 pennen= 20 cm hoogte! Als ik de Duitse beschrijving lees, dan staat er dat je de laatste 7 steken om de tweede naald afkant....! M.a.w. nog meer pennen. Kortom zit er geen fout in het patroon? Hallo, Ik begrijp de beschrijving van het afkanten voor de mouw niet goed. Is het de bedoeling dat er 3 steken aan het begin van de naald worden afgekant, dus bij de naald heen en bij de naald terug. En dat er 14 keer aan beide kanten op de pen ( dus in 1 naald) 1 steek wordt afgekant. En tot slot nog 7 keer aan het begin van de naald, dus bij de naald heen en terug. Anders kom ik niet op 12 steken over en de 13 cm aan hoogte erbij. Graag uw opheldering. Het klopt precies zoals je het begrijpt. Je kant de heengaande en de teruggaande naald af, zodat je aan beide kanten van de mouw afkant. Is het patroon over 1 of 2 pennen per hokje.en hoe ga je veder met A2ik begrijp er niks van , zal u mijn dat willen uit leggen . Een hokje is een steek en je begint het telpatroon onderaan en werkt naar boven toe. Je leest de steken in het telpatroon van rechts naar links. Als je 1 rij klaar hebt, lees je de volgende rij weer van rechts naar links, totdat je alle rijen (= naalden) gebreid hebt. Bij het breien van het voorpand staat: brei verder in patroon. Mijn vraag is: moet er na elke 10e naald ook gemeerderd worden? Of hoeft dat niet meer? Nee, je hoeft dan inderdaad niet meer te meerderen. Graag zou ik willen weten of het aantal gr. klopt met het patroon, lijkt mij dat er meer in gaat dan 250 gr.